Hopefully you’ve done some spring cleaning. Maintaining this state of cleanliness will be quick and simple if you set up a realistic schedule of cleaning tasks for your home. Get off to a good start by keeping your cleaning supplies stocked so that you have what you need on hand. Walk through the rooms of your house and make a priority list of what needs to get done in each room weekly, bi-weekly, and monthly. A full bath may need cleaning more often than a half bath. The same goes for a guest bedroom, formal dining room or living room. Begin your basic cleaning in each space by picking up clutter so you can see the actual surfaces that need attention. Start by dusting all surfaces from the top down. Don’t neglect high places like the tops of doors, big furniture pieces, and ceiling fans. And don’t forget about window blinds. Then, clean door knobs and cabinet handles, light switches, and anything else that hands and germs come in constant contact with. Wax any wood furniture, and vacuum upholstered furniture. Shake out any throw rugs, sweep or vacuum all floor surfaces, then mop wood and tile floors. Although having an organized plan makes cleaning easier, it can still be overwhelming if other life responsibilities get in the way. 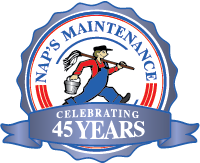 That’s where NAP’s Maintenance Services can help. With all of our residential projects, we treat your home as if it were our own, handling every job thoroughly and with care. Contact us to discuss your cleaning needs.